Last Thursday, I attended the Market Research Society (MRS) Financial Services Research Conference for the first time at the Hilton London Bankside. The Conference was enthralling and thought-provoking throughout, with the excitement ratcheted up a notch by a fire alarm, which was greeted nervously by all in the aftermath of the recent attacks in Paris. Perhaps this and the bunker-like setting contributed to the sense of a Financial Services industry that continues to feel under siege. I have picked out five recurring themes that emerged from the presentations made at the conference by among others: Aviva, Lloyds Banking Group, Capital One and SunLife Direct, where possible, making some suggestions on how each of them could be acted upon. Jan Gooding, Group Brand Director at Aviva gave the opening keynote address and kicked things off in a suitably combustible fashion by declaring that, “Truth often comes before research, which may explain why innovation companies start with a brainstorm.” Gooding didn’t leave it there, intoning that to be more customer-centric, “Financial services brands need insight not research.” I couldn’t agree more that research is just a means to an end, the end being – understanding that you can, and often do, successfully act upon. This theme was picked up later in the day by Marta Kovacs, Head of Research at Clydesdale Yorkshire Bank who stressed the need to really understand what matters most to customers. 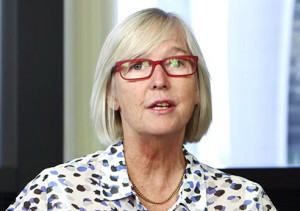 Gooding went on to highlight the importance of, “Aligning research programmes to business plans not just marketing plans.” Achieving such an alignment is more likely to result in real action. Gooding referenced by way of example, acting upon the insight that new parents do not have the time or inclination to evaluate financial products carefully – so make taking out life insurance an absolute no-brainer for them – offer it for free in the first year. Devise your research programmes directly from business priorities and clearly communicate the contribution you are making here to influential colleagues. Gooding revealed that Aviva are, “Extremely interested in the EFFORT that customers have to expend to engage with us.” This served to introduce the second major theme of the day which formed the backbone of the presentation by Catherine Borrie, Research Manager at Capital One – namely, putting the customer experience at the heart of strategy. Borrie focused upon the less glamorous world of customers who fall behind, or into difficulties and end up in Arrears or Collections. Customers facing this predicament need to feel trusted by the brand, they crave a genuine and empathetic conversation. Borrie emphasised the need to understand the nuances of customers’ lives. For many in arrears, damage to their credit rating that might limit their chances of getting a mortgage in the future, was much less of a pre-occupation, than avoiding a utility company switching off their supply next week. UKAR – the so-called “bad bank” – happy to lose customers off their books as it helps them repay UK taxpayers. Another set of customers in a different kind of difficult place, were those who found themselves under the wing of UKAR, the so-called “bad bank” established to look after the mortgage and loan books of the now government-owned Bradford & Bingley and NRAM plc. 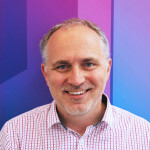 Tim Newman of UKAR explained that they were now actively using tracking research that was customer journey focused rather than following the contours of their own compliance landscape. Understand fully how the customer experience you offer is actually experienced by customers – what do they highlight as great or find really frustrating? Where would improvements make a real difference for them, and why? Map out some of your more important customer journeys, both the current actual and desired future versions, taking account of: performance measures, customer expectations, commercial drivers, communications, operations, data held & data opportunities, platform constraints and capabilities – wherever possible involve your customers in contributing to this process. Whilst mapping technologies are improving all the time – low tech solutions like landscape flipchart sheets with swimlanes, still have plenty to offer as a starting point! 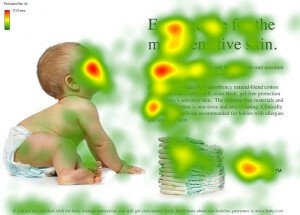 Lloyds Banking Group are harnessing eye-tracking to help understand how consumers read home insurance renewal letters. The third theme is very much a two-way street, in some areas banks are playing catch up with rapidly changing customer behaviours. Neil Sanson of Opinion Leader highlighted how new FinTech players in the payments space, Paym among them, were responding to consumer demand for ever greater device utility, so long as security fears could be allayed. Meanwhile William Nicholas, Market Research Manager at Lloyds Banking Group was in the lane going in the opposite direction, in trying to harness Behavioural Science to change the way customers respond to home insurance renewal communications. Nicholas recounted how they had used eye-tracking to examine how existing insurance renewal letters were read by customers – examining gaze path and order. Do the analysis to fully understand current patterns of behaviour – Who are your habitual users or buyers? What acquisition sources have they been acquired from? How does their profile, motivation, attitudes and behaviour differ from more fickle one-off purchasers or rejecters? 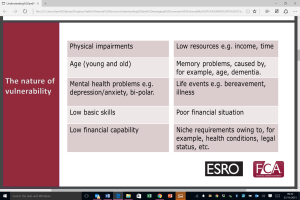 FCA and ESRO highlighting the range of different and less obvious forms of Consumer Vulnerability. In the wake of the Credit Crunch and the long period of austerity that it ushered in, the Financial Services industry is somewhat belatedly trying to get in touch with its softer more compassionate side. A world away from LIBOR or FOREX-fixing and the red meat of Investment Banking. An excellent presentation by the Financial Conduct Authority (FCA) struck a sobering note by highlighting that we are all as consumers potentially vulnerable. It is not solely the physically or financially impaired that need to be managed with care and consideration. The bereaved, depressed, young and old, time poor and poorly educated, all have different needs and vulnerabilities that should to be recognised and responded to. Evaluate how adept your organisation is at spotting the triggers that can produce vulnerability – research suggests that far too many staff in financial services institutions don’t even fully understand what a Power of Attorney is, let alone what it might denote! Create detailed and rich personas for relevant types of vulnerable consumer, using them to brief staff on how they should be appropriately managed day-to-day and reflected within marketing communications. 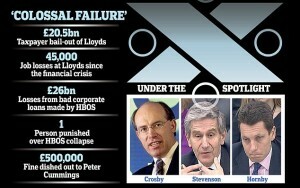 Casting a long shadow – The conference coincided with the release of the HBOS report (Graphic – www.thisismoney.co.uk). The fact that the staging of the conference coincided to the day with the release of the long-awaited HBOS Report into the (mis)behaviour of senior executives at the bank, served to highlight just what a long road the industry is on to rebuild trust and brand image. What Governor Mark Carney at the Bank of England called the ‘Age of Irresponsibility’ may have ended but the memories are still too fresh for many consumers and businesses to move on and look at financial services providers anew. SunLife Direct tried rather appropriately injecting a bit of humour, light and warmth by commissioning a survey investigating the link between money and happiness. This found amongst many other things that you need £390 in disposable “spare” cash at the end of the month to be averagely happy. It also revealed, with a chilling touch of irony, that 1 in 6 children are relying upon a financial inheritance from their parents, at the same time as 1 in 6 parents are looking to their children for financial support in the future. Predictably the mass media gave any cheery stories short shrift and focused upon the bad news that emerged from this study. A very different paper from Aston Business School & Harris Interactive focused upon trying to measure brand sustainability by using measures for current brand equity, future brand relevance and energy (an amalgam of momentum, excitement, anticipation & interest). The new and established ‘challengers’ in the shape of Metro Bank, first direct and Nationwide all performed well on these dimensions, whilst the giants of the industry stumbled along together in the pack. Have you revisited your brand definition and model to ensure that it is still fit for purpose in the new chastened ‘Age of Responsibility’? Have you benchmarked or tracked Brand Health and performance versus key competitors? Do you consequently know where you are comparatively strong or weak and with whom? Do you have a comprehensive programme in place to move consumer perceptions forward through compelling actions rather than words? Have you made your marketing part of the service – leveraging data you hold, and knowledge you have, to the benefit of the public at large? If you would like to discuss any of the above themes in more detail, or explore further some of the suggested actions, do get in touch with us.